30ml Pump of our raved about Simple & Sublime Cleansing Balm. **Please note the Discovery Collection is limited to 3 purchases in a calendar year. For those of you who have not experienced the GJ phenomenon, this is especially for you to try our line and get your glow on! For just €20 including delivery we will send you our ‘New To Natural Discovery Pack Collection’. 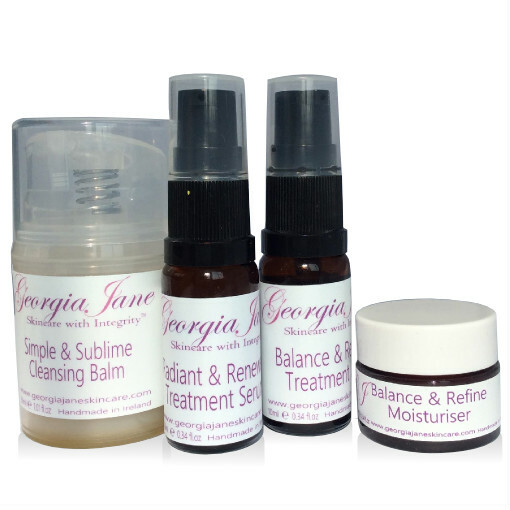 Showcasing our four,100% Natural, core skincare products at above industry standard sample sizes. **Full instructions are included in each Discovery Pack. 10ml Pot Moisturiser by skin-type. 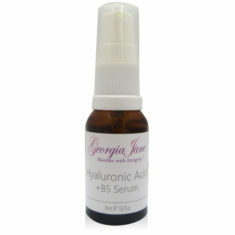 10ml Pump Facial Treatment Oil by skin-type. 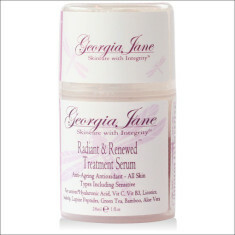 10ml Pump of our superb Radiant & Renewed Treatment Serum. Our GJ Discovery Collection gives you enough of our four key products to last up to 3 weeks, following recommended usage. Just choose your skin type and let nature get to work and find out what makes you glow! Cleansing Balm Ingredients: Rice Bran Oil (Oryza Satvia), Castor Oil (Ricinus Communis,) Prunus Armenica(Apricot Oil), Carthamus Tinctorus (Thistle Oil), Cera Bellina (Polyglyceryl-3-Beeswax), Hydrogenated Palm (and) Palm Kernel Glycerides, EcoCert NPA, Hydrated Silica, Polysorbate 80, Caprylic/Capric Triglyceride, Euterpe Oleraca Fruit Oil (Acai) Copaifera Officinalis (Balsam Copaiba), Carapa Guaianesis Seed Oil (Andiroba),Tochopherol (Vitamin E), Co2 Extracts Seabuckthorn Oil (Hippophae Rhamnoide), Rosehip Oil,(Rosa Canina) Calendula Oil (Calendula Officinialis) Rosemary Extract, Bisabolobol, Usnea Barbata (Lichen) Extract, Proprietary Blend of 100% Natural Therapeutic Grade Essential Oils, including Monarda Fistulosa(Bee Balm) Fower Oil, Citrus Aurantium Var. Amara (Neroli/Orange Blossom) Oil, Boswelia Carterii Oil (Frankincense), Cananga Ordorata Var. Genuina (Ylang Ylang) Oil. **Linalool, Limonene, Geraniol, Citronello, Benzyl Alcohol, Benzyl Benzoate,Farnesol, Citral, Eugenol, Benzyl Salicylate. Balance & Refine Moistuiser Ingredients: Cananga Odorata (Ylang Ylang Distillate), Aloe Barbadensis Leaf -Juice, Hamemelis Virginiana (Witch Hazel Distillate) Citrullus Lantus (Watermelon Seed Oil) Spirea Ulmaria (Meadowsweet Extract) Vegetable Glycerine, Natural Plant Extracts of Centella Asiatica (Gota Kola),Geranium Maculatum(Geranium), Saintpaulia Ionantha,(African Violet)Flower, Recutita Matricaria (Chamomile German) Lippia Citriodora (Lemon Verbena)Helianthus Annuus (Sunflower) Seed, Epilobium Angustifolium(Willow Leaf) Phyllantus Emblica (Amlaki) Fruit, Algae Extract, Foeniculum Vulgare(Fennel) Fruit, Niacinimide, Cetyl Palmitate, Sorbitan Palmitate, Sorbitan Olivate (Olive Oil Derived Emulsifier) Cetearyl Olivate, Sorbitan Olivate(Olive Oil Derived Emulsifier)Natural Plant Extracts of EpilobiumFleischeri,Watercress,Sage,Burdock,Lemon Peel, Ivy, Saponaria, Bladderwrack, Sodium Lactate, Glucosamine, Dimethicone Vinyl Dimethicone, Silica, Dipalmitoyl Hydroxyproline (Collagen Amino Acids) Ethoxydiglycol(EDG) Copaifera Officinalis (Balsam Copaiba) Oil, Carapa Guaianesis Seed Oil(Andiroba Oil) Euterpe Oleraca Fruit Oil(Acai Fruit Oil), Hydroxypropyl Starch Phosphate, Hydrolyzed Lupine Protein(Peptide) Tocopherol (Vitamin E), Bisabolol, Ferulic Acid, Sclerotium Gum,Tapoica Starch, Glyceryl Stearate, Usnea Barbata(Lichen) Co2 Extract, Helianthus Annuus Seed Oil, Polyglyceryl-6 Caprylate, Polyglyceryl-3, *Proprietary Blend of 100% Natural Therapeutic Grade Essential Oils including Monarda Fistulosa (Bee Balm)Fower Oil, Citrus Aurantium Var.Amara (Neroli)Oil, Pelargonium Graveolens (Geranium) Oil, Citrus Deliciosa(Tangerine) Oil, Cananga Ordorata Var.Genuina (Ylang Ylang)Oil, Phenoxyethanol & Ethylhexylglycerin, Phenoxyethanol, Sorbic Acid, Gluconolactone & Sodium Benzoate, Disodium EDTA, BHT, Polysorbate 80, **Linalool, Limonene, Geraniol, Citronello, Benzyl Alcohol, Benzyl Benzoate,Farnesol, Citral, Eugenol, Benzyl Salicylate. Hydrate & Perfect Moisturiser Ingredients: Aqua, Aloe Barbadenis Leaf Juice,Vegetable Glycerine,Natural Plant Extracts of Helianthus Annus (Sunflower)Seed,Epilobium Angustifolium(Willow Leaf),Phyllanthus Emblica(AmlakiFruit), Algae Extract, Foeniculum Vulgare(Fennel)Fruit, Borago Officinalis(Borage)Seed Oil, Niacinamide, Cetearyl Olivate,SorbitanOlivate(Olive Oil Derived Emulsifier)Sodium Lactate,Glycyrizza Glabra (Licorice Root Extract)Propanediol(Natural Corn Derived Glycol) EcoCert NPA,Glucosamine (N-acetyl-D)Cetearyl Ethylhexanoate,Rubus Idaeus(Red Raspberry Seed Oil)Cetyl Palmitate,Sorbitan Palmitate,Sorbitan Olivate,(Olive Oil Derived Emulsifier) Glyceryl Stearate, D Panthenol, Copaifera Officinalis(Balsam Copaiba),Carapa Guaianesis Seed Oil (Andiroba Oil Fruit Oil) Euterpe Oleraca Fruit Oil(Acai Fruit Oil),Hydroxypropyl Starch Phosphate, Dipalmitoyle Hydroxyproline(Collagen Amino Acid) Hydrolized Lupine Protein(Peptides) Sclerotium Gum,‎Tocopherol (Vit E),Co2 Extracts of Sea Buckthorn Oil (Hippophae Rhamnoide) Calendula Oil (Calendula officinialis), Rosehip (Rosa Canina Seed Oil) Gamma Oryzanol(Rice Bran Extract),Camellia Sinensis(Green Tea) Helichrysum Italicum (Immortelle), Rosemary Officinalis, Proprietary Blend of 100% Natural Therapeutic Grade Essential Oils, including Cistus Ladaniferus(Cistus) Resin Oil, Citrus Aurantium Var.Amara Flower Oil(Neroli) Boswellia Carterii (Frankincense) Resin, Phenoxyethanol & Ethylhexylglycerin, Phenoxyethanol, Sorbic Acid,Gluconolactone & Sodium Benzoate, BHT, Polysorbate 80, Disodium EDTA,** Limonene, Linalool, Geraniol,Farnesol, Eugenol, Citronello,Citral, Benzyl Benzoate,Coumarin. Balance & Refine Treatment Oil Ingredients:Citrullus Vulgaris(Watermelon)Seed Oil,Carthamus Tinctorius(Thistle)Seed Oil, Jojoba Seed Oil (SimmondsiaChinensis), CorylusAmericana(Hazelnut)SeedOil, BoragoOfficinalis(Borage)Seed Oil,Cannabis Satvia (Hemp Seed Oil)Curcubita Pepo(Pumpkin Seed)Oil, Salvia Hispanica(Chia) Seed Oil, Calophyllum Inophyllum(Tamanu)Seed Oil,Punica Granatum(Pomegranate)Extract, Laminara Ochroleuca(Antilikeune)Extract,Copaifera Officinalis(Balsam Copaiba),Carapa Guaianesis Seed Oil(Andiroba),Copaifera Officinalis(Balsam Copaiba),Euterpe Oleraca Fruit Oil(Acai),Copaifera Officinalis (Balsam Copaiba)Astor Maritima (Sea Astor Oil) Alaria Esculenta Extract,Tochopherol(Vit E)Citronellyl Methylcrotonate, Bisabolol,Usnea Barbata(Lichen Extract),Rosmarinus Offininalis,(Rosemary)Extract, Seabuckthorn Oil (Hippophae Rhamnoide),Rosehip Oil,(Rosa Canina)Calendula Oil(Calendula Officinialis)Daucus Carota Satvia(Carrot)Seed Oil, *Proprietary Blend of 100% Natural Therapeutic Grade Essential Oils including Monarda Fistulosa(Bee Balm)Fower Oil, Citrus Aurantium Var.Amara (Orange Blossom) Oil, Citrus Aurantium Var.Amara (Neroli/Orange Blossom)Oil, Pelargonium Graveolens (Geranium) Oil, Citrus Deliciosa (Tangerine) Oil, Cananga Ordorata Var.Genuina (Ylang Ylang) Oil,*Linalool, Limonene,Geraniol, Citronello,BenzylAlcohol, BenzylBenzoate,Farnesol,Citral,Eugenol,Benzyl Salicylate.